We have found another terrific product for you! Hatched!™ Eggshell is a superior, completely safe way to provide your pets with the proper amount of calcium by letting them decide how much they need! Hatched!™ Eggshell is manufactured using a patented, chemical free separation process in a US – FDA regulated facility and it is packaged using FDA approved materials. Most of you probably already know what happens when your bird does not get enough calcium in their diet. Unfortunately this knowledge often comes at the expense of a beloved hen that has become egg-bound and died before you were able to figure out the problem and make corrections. Although not the norm, too much calcium can also become a problem for our caged birds when we provide them too much calcium that they have no choice but to intake because we are adding it to their drinking water or soft food. Allowing your birds free choice in obtaining their own calcium can be a good thing, as long as you also supply the proper ratio of phosphorous, magnesium and vitamin D3. The normal calcium to phosphorous ratio in chickens is 2:1. 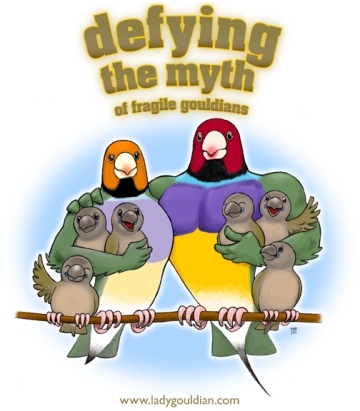 It is likely that a similar ratio would be appropriate for most species of birds although specific research data is lacking. *Window glass absorbs most of the necessary ultraviolet radiation needed to form vitamin D, even though sunlight does pass through the glass. Therefore your birds cannot manufacturer their own vitamin D3 even if you have sunlight coming thru windows into your aviary. Hatched!™ Eggshell and Herb Saladtm compliment each other well and can be served mixed, in the same dish. 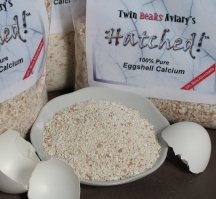 Hatched!™ Eggshell is also enjoyed by Sugar Gliders, Rabbits, Chinchillas, Guinea Pigs and Hamsters. Hatched!™ Eggshell is available in: 1, 2, 5, and 10# bags. Bulk Sizes: 20, 40 and 80# bags.